UHRICHSVILLE, Ohio (WKYC) – An Ohio couple is facing charges for allegedly handing out cookies laced with laxatives to school employees. 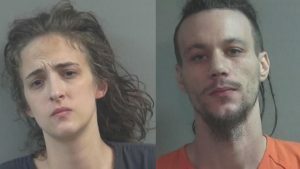 Bo Cosen and Rachel Sharrock are charged with contaminating food for human consumption as well as a list of misdemeanor charges. The couple allegedly handed out laxative-laced cookies to members of the Ohio Association of Public School Employees who were on strike near the couple’s trailer in Uhrichsville. Police said someone learned there was a Facebook Live video of the couple allegedly making the laxative-laced cookies. Police also said no one consumed the cookies, which were brought to the police department. Uhrichsville police are trying to locate a facility to have the cookies tested. Cosen was arrested April 5th for threats he allegedly made against the picketers. He was released Monday at arraignment and rearrested Monday evening for the cookies. Both Cosen and Sharrock are being held on a one million dollar bond. Police said Cosen also admitted to trafficking and drug sales.